Jenkins Room, 10 a.m., Saturday 19 September 2015. During your time as students here at the Church of Ireland Theological Institute, you will constantly hear the passage of time each day being punctuated by the ringing of the chapel bell calling us all as a community, students and staff, to our common prayer in the chapel. It may sound urgent at times, when you are in the middle of conversation or work, or simply allowing your mind to wander. It may sound irritating in the morning, when you are trying to finish breakfast, catching the last 39th and 40th of those forty winks, or emerging from the shower. It may seem annoyingly irrelevant late at evening when you are trying to finish an essay, go for a walk down to the Glenside, or get an early night. And the Curate that ministereth in every Parish-church or Chapel, being at home, and not being otherwise reasonably hindered, shall say the same in the Parish-Church or Chapel where he ministereth, and shall cause a bell to be tolled thereunto a convenient time before he begin, that the people may come to hear God’s Word, and to pray with him. Even if it is not explicit and printed in The Book of Common Prayer (2004), it is part of the tradition of The Book of Common Prayer, part of Anglican culture and legacy, that as deacons and priests we should pray daily, privately and publicly. But therein lies a problem or two. Some of us are in danger here of allowing ourselves to sit in on three daily services in the chapel. Then, over a number of weeks, we allow this to substitute for our private prayers, and before we realise it, we are merely passive attenders at public prayer, and not praying in private at all. We hear the bell, but we say: “I can pray in my own room.” We neglect public prayer, and think private prayer is good for me. Soon it becomes good enough for me, and then not only to neglect to pray for the needs of others, but I neglect to pray at all, and think I’m praying when I am focussing only on me and my needs. I seem to take longer to get my books together, to find my socks or to dry my hair. Prayer time becomes less focussed and shorter. And at some time, we realise we are going through the motions and not really praying. When we get to that stage we realise we have lost the rhythm of prayer and the substance of prayer. And it is almost like one of the basic laws of physics beginning to kick in. Because, there is an inverse proportion between the efforts we put into correcting this and our recovery of what I have described as the rhythm and substance of prayer. 3, We may never have learned that there are different styles and approaches to prayer, and so I may not know the difference between a style of prayer that is appropriate to me, and be able to recognise a style of prayer that may not be appropriate for me but is appropriate for others. 3, Finding appropriate styles of prayer. Saint Paul says we should pray unceasingly (I Thessalonians 5: 17). But, to be realistic, how often should you pray? So often we pray because prayer is a duty. We were taught as children to pray each morning and each night, but when it becomes a routine and a chore it loses its delight, and the habits of childhood disappear easily when we are adults. Or, as we find personal prayer loses its lustre and appeal, we start relying on our community prayers in our parish or in the institute chapel, allowing public prayer to fill the gaps when I have started to falter in private prayer. How often should we pray each day? I find the sound of Angelus bell, twice a day, not an intrusion on my personal piety, but a reminder that my daily life should be punctuated with a rhythm of prayer. When I am in Muslim countries, I find the call to prayer from the minaret, not twice but five times a day, a reminder that my daily life should be punctuated with a rhythm of prayer. The Jewish expectation is that the adult male Jew should pray three times a day, in the morning, in the afternoon, and in the evening. In the Rule of Saint Benedict, the major themes are community, prayer, hospitality, study, work, humility, stability, peace and listening. These fixed-hour prayers came to be known as the Divine Office – and remember that the word office comes from the Latin word for work: the Benedictines called the prayers the Opus Dei or Work of God. In the West, the modern Liturgy of the Hours focuses on three major hours and from two to four minor hours. The major hours consist of the Office of Readings (Matins), Morning Prayer (Lauds) and Evening Prayer (Vespers). The Office of Readings consists of: a hymn, one or two psalms, often divided into three parts; a scripture reading; a reading from the life of a saint or martyr or a theological work or commentary; sometimes canticles and hymns; a concluding prayer and a short concluding verse. Morning Prayer is marked by praise, Evening Prayer by thanksgiving. Night prayer can be seen as a spiritual exercise in preparing the soul for its passage to eternal life. Benedictine spirituality teaches us that prayer is not a matter of mood. To pray only when we feel like it is more to seek consolation than to risk conversion. To pray only when it suits us is to want God on our terms. To pray only when it is convenient is to make God a very low priority in a list of better opportunities. To pray only when it feels good is to court total emptiness when we most need to be filled. We can be sure that Saint Benedict and the early monks understood that prayer is central in the life of a monk. But we can see too how this structure and the Benedictine tradition were adapted by Thomas Cranmer for The Book of Common Prayer, so that Anglicans were encouraged to pray at least twice a day, perhaps three times a day. Morning Prayer and Evening Prayer are quintessentially Anglican, but it could also be said that they are quintessentially Benedictine. When we are presented for ordination, we are charged with leading God’s people in prayer and in worship, teaching and to encouraging them. If your priestly ministry is going to be truly spirit-filled, grace filled, and Christ-focussed, and giving priorities to the ministry and mission of the Church, then you must be aware of the pitfalls of conforming to the expectations of those who demand and who put pressure on you to supply, even when those demands are far down the list of priestly priorities. As one rector reminded me shortly before my ordination, sometimes, sometimes, the most urgent demands are not the most important one. Keep before you always the priority of prayer: corporate prayer and private prayer. Remember the value of setting aside times of prayer, and of being faithful in the regularity of prayer. When it becomes difficult to pray, because of demands or because of spiritual problems, you will realise the richness of the forms of prayer and the times of prayer provided in The Book of Common Prayer. Prayer is the place where pride is abandoned, hope is lifted, and supplication is made. 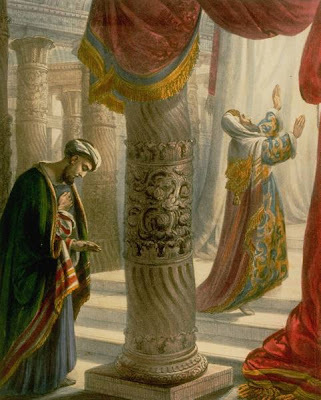 The Pharisee and the Publican ... what was wrong with the prayer of the Pharisee? In the parable of the Pharisee and the Publican (Luke 18: 9-14), the two men pray for themselves and bare themselves before God. The Pharisee gives thanks to God when he prays, and by all the standards of the day he is a good man: he fasts, tithes – indeed, tithes more than he has to – and prays regularly. Yet neither man prays for the other man in his company. The difference between their prayers is that in his praying the Pharisee disdains the needs of others. If prayer is only about me and my needs and does not take account of the needs of others, have I been praying truly? Prayer is not a shopping list that we tick off, and then use to tick off God when our shopping trolley has not been filled. We often reduce prayer to requests for healing and for the solution of our own problems, only to find that the answers we hoped for often do not come. 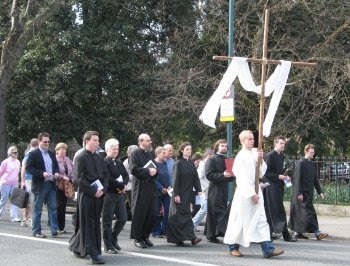 When the laity are asked to lead the prayers of the people or the intercessions on a Sunday, they are often given sheets of paper with a shopping list that has already been dictated for them by the rector or the parish priest so that no longer can they be truly called the prayers of the people. What’s wrong with praying: “Lord, we confess we don’t always know how to pray by ourselves. But we thank you that you know our needs before we can even find words to express them. We give this time to you and ask you to continue speaking to us and through us”? 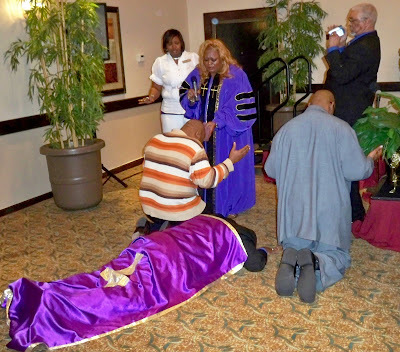 When people complain that visiting clergy fail to pray during a visit to a hospital bedside or a bereaved household, it may be because we have failed to develop the skills of praying extemporaneously or with spontaneity, or that we have not been trained in identifying the spirituality of those we are visiting and so cannot find styles of prayer that are appropriate for those we are with. Although the Anglican tradition has often been defined by The Book of Common Prayer, and while we have paid great attention throughout Anglican history to the common prayer of the Church, we have paid little attention to training people to help others and to help themselves to pray. So, let’s look at some key example of teaching and praying in the New Testament. Saint John the Baptist knew the advantage of being a prayerful servant of God, and who taught his disciples to pray. When the disciples ask Jesus to teach them how to pray, he teaches them the Lord’s Prayer (Matthew 6: 9-13; Luke 11: 1-5). But he also gives examples of prayer in parables, such as the story of the Pharisee and the Publican (Luke 18: 9-14). The Apostle Paul reminds us to “pray without ceasing” (I Thessalonians 5: 17) and to “always give thanks” (Ephesians 5: 20). Praying together has been a hallmark of Christian life since the beginnings of the Church, as the opening reports in the Acts of the Apostles make clear. Teaching others how to pray is a privilege and responsibility, but in my experience teaching here at the Church of Ireland Theological Institute, I have learned of the need for clergy to develop the skills of identifying the different approaches to spirituality that mean individuals have different needs in prayer styles. An individual’s spiritual life can be affirmed and can grow by identifying with appropriate approaches to prayer. We each grew up with a different style of prayer. For some, it was reading from the bible, perhaps by the father of the family, followed by short private prayer, even in a group, and often concluding with the Lord’s Prayer and or the Grace. For others, it may have been kneeling as a family, or being taught to knell by the side of your bed, first thing in the morning and last thing at night, with your hands flat together and upward, and your eyes closed. For one or two of you, it may have been the family rosary. But the confusion between private prayer and public prayer was always there. Some of you may remember elderly people coming to Mass in the parish church, yet continuing throughout the liturgy with their own private prayers. Others of you will notice here how we often we confuse public intercessions and private intentions in our prayers in parish churches on Sundays … and it happens here too in the life of the chapel. When we are honest with ourselves, most will admit that prayer does not always come easily. But the same style of prayer does not suit every personality, nor does the same type of prayer suit every time and situation. None of us would expect the same style of prayer to work in individual prayer, in spontaneous one-to-one prayer, in group prayer and then in liturgical prayer. So why should we expect everyone to accept the same approach to prayer when it comes to their spiritual lives, their growth and their development? Two Anglican writers in particular have made important contributions to identifying the different spiritual types and their prayer needs: Urban T. Holmes was a noted writer on spirituality and ministry and Dean of the School of Theology at the University of the South, Sewanee, Tennessee, until he died in 1981 at the age of 51; Dr Corinne Ware is a pastoral psychotherapist and Assistant Professor of Ascetical Theology at the Episcopal Seminary of the Southwest in Austin, Texas, where she teaches courses in spirituality. Similarly, in the Roman Catholic tradition, Monsignor Chester Michael and Marie Norrisey have found that many people feel they are shut out of the prayer life of their parishes or congregations because of a “one-size-fits-all” approach to prayer, to spiritual exercise and to meditation. In a more developed exploration of these ideas, Ware speaks of two “axes of preference” or directions in which people are drawn: Thinking-Feeling and Abstract-Concrete. The vertical speculative-affective axis intersects with the horizontal apophatic-kataphatic axis forming quadrants. Within these quadrants, identified by the bordering poles, we find the four spiritual types. In which quadrant would you place yourself? Quadrant 1, for instance, is influenced by the two points, speculative thinking and concrete or “kataphatic” imaging of God. Each of us has a different approach to our style of spirituality so that it has a bearing on how I fit into a congregation, how I pray, how I respond to or have certain needs in spiritual direction. Type 1: Type 1, the speculative/kataphatic or head spirituality, is an intellectual or thinking spirituality that favours what it can see, touch, and vividly imagine. It can be expressed theologically in concepts, such as God as Father, or the centrality of Christ and the incarnation. The choices of this group will be based mostly on activity and on corporate gathering. Their spirituality relates comfortably to the spoken word, and so they appreciate study groups, better sermons, and some sort of theological renewal within the worshipping community. The contribution of those with Type-1 spirituality to the whole is invaluable. They produce theological reflection, debate ethical issues, provide critique and engage in education and publication. They seek to make sense of experience and to name it. They codify and so preserve the faith story from generation to generation, and seek guidance primarily in Scripture and from the sermon – that is, from words. “God speaks to them through the written word,” Ware explains. Growth for such people lies in their gradually sensing their interior connection with God. The danger lies in “falling outside the circle” through an over-reliance on rationalism, an over-intellectualisation of the spiritual life and a consequent loss of feeling. To enrich their experience they can benefit from the emphases of the opposite quadrant, Type 3, on fostering solitude, introspection, and silence, risking the unstructured, the solitary, and the silent. Type 2: People in Type 2, the affective/kataphatic or heart spirituality type, still emphasise the anthropomorphic representation of God and the centrality of scripture, but are combined with a more affective, charismatic spirituality that aims is to achieve holiness of life. The transformational goal is personal renewal and holiness, and so Type-2 people find God through the heart, in feelings and in the moment. Characteristically, they emphasise evangelism and transformation, and value corporate worship that includes time for witnessing, testimonials and music. They stress the immanence of God over the transcendence of God, and the words of their prayers are less formal than they are among words than Type-1 people, and praying is usually extemporaneous. Physically, they express their joy in such ways as raising their hands. Although prayer is made up of words for this group, the words can be less formal than the words for people in type one, and praying is often extemporaneous. The Type-2 person may respond well to a loosely-structured daily spiritual discipline. They respond to art, music, and fellowship. These people focus on personal service to others but often with the caveat that the service provides an opportunity to witness about their faith. They often need permission to acknowledge anger, disappointment, sadness, and doubt, and to be less than ideal. Their spirituality is enriched by being able to see other expressions of faith as having value and making a contribution. With their emphasis on “pietism,” they can become too exclusive, not allowing themselves to acknowledge the spiritual experience of others – especially when it different – and they can be closed to the risk of new thought. They could be encouraged to risk new experience on their own and to trust God to be with them in their journeys, seeing God as nurturing rather than punitive. Type 3: Type 3 is the affective/apophatic approach, which can be described as mystic spirituality. With Type-3 people, hearing God rather than speaking to God is important. People attracted to this type of spirituality are often contemplative, introspective, intuitive, and focused on an inner world. God is ineffable, unnameable, and vast beyond any known category. Austerity and asceticism are appealing to many in this quadrant as they listen attentively to the inner voice. They often find themselves uncomfortable and not fitting in, especially within Western Protestantism, but will value the works of Thomas Merton and Anthony de Mello, or appreciate the apophatic approach of Eastern Orthodox spirituality or a creation-type theology. “For them,” Ware says, “prayer is not addressing God but is listening to God.” The Desert Fathers and the mediaeval mystics are examples of this type. “People attracted to this type of spirituality love walking the labyrinth,” she says. Often by nature they are contemplative, introspective, intuitive, and focused on an inner world. For them, “being” is more important than “doing.” Many in Type-3 write and publish and provide the especially inspirational and uplifting spirituality that fuels our daily lives with a sense of the Holy. They provide much of the intellectual interpretation of the theological writing by those in Type-1, and they seek to push the frontiers of spirituality. Those in Type 3 need permission to retreat and seek solitude because they may feel guilty as they carefully hide their desire for the nourishment of solitude and silence. The danger in this quadrant is of falling into the wrong sort of “quietism,” with an exaggerated retreat from reality and from interaction with the world and a spiritual passivity that deprives the world of the treasured gifts of mysticism. The mystic who lacks the balance of the other spiritual expressions is also deprived of the blessing of interaction with others. Of course there are those who have a calling to solitary prayer, but retreat time needs to be balanced with involvement and interaction. Type 4: Type 4, the speculative/apophatic type, includes the visionaries who emphasise kingdom spirituality. People in this quadrant are usually the smallest group, making it the most difficult to describe. They are at prayer as they work for the Simon Community, Christian Aid or with a human rights campaign, as they feed and clothe others. For these people, prayer and theology are best expressed in action. For them, work and prayer is the same thing. Type-4 people may include the Hebrew prophets, the Apostolic Fathers, Joan of Arc, Martin Luther, John Calvin, Dorothy Day and Mother Theresa of Calcutta. Type-1 people can benefit from the method known as Lectio Divina, for example. Type-2 people need experiment in prayer, liturgy, and music with musical expression. Type-3 people can benefit from silence in prayer, and from being asked to pray privately. Similarly, Chester Michael and Marie Norrisey have found that many people feel they have been shut out of the prayer life of their parishes or congregations because of a “one-size-fits-all” approach to prayer, spiritual exercise and meditation. They drew on the four personality types or temperaments defined by Carl Jung, enhanced by Isabel Briggs Myers and her mother Katherine Cook Briggs, and the popularised by David Kiersey: the artisan or “free-spirited” temperament, the guardian or “practical” temperament, the idealist, and the rationalist. ● The “Practical” type (40 per cent of the population), is steady, reliable, a realistic decision-maker, seeks order, dislikes ambiguity, is conforming, fastidious and is often moralistic, can be intolerant and can be over-controlled. ● The “Rational” type (12 per cent) is analytical, likes independence, takes pride in his/her objectivity and calmness, is visionary, attentive to theory and model, is often clever, and can be indifferent to others and even condescending. ● The “Free-Spirited” type (36 per cent) is an adaptable realist who is focussed on the here-and-now, is good with tools and instruments, hates boredom, wants to be audacious, values generosity, and can be inattentive or even unstable. ● The “Idealistic” type (12 per cent) is tender-minded, enthusiastic and insightful, seeks new projects and complexity, is flexible, aesthetic, non-conforming, and can be snobbish, self-pitying and dreamy. Michael and Norrisey define four prayer forms – the Ignatian, Franciscan, Augustinian and Thomistic – that map according to the four distinctive temperaments, and give each temperament something like a patron saint whose spirituality seems to match the temperament's spirituality. For instance, the hard-nosed Ignatius is matched with the practical temperament. Practical people like to follow the rules, and they like predictability and order. The Ignatian Spiritual Exercises provide plenty of steps and order that temperaments more taken with spontaneity would find difficult. As Michael and Norrisey point out there is can be no “one-size-fits-all” approach to prayer, spiritual exercise and meditation. In ministry, it is a challenging task not only to help people to identify their own strengths and weaknesses, but to help each of them to draw closer to God and to one another in prayer. At the same time, be sensitive to other people’s methods and needs in prayer. Because we are in community here, or because later you find people are your parishioners never means that we share the same priorities, comforts, or even discomforts in prayer and in the spiritual life. Be regular in attending and in celebrating the Eucharist. Take this holy sacrament to your comfort. Remember to take at least one retreat a year. Just like a puppy is not only for Christmas, retreats are not just for the days or day before your ordination. Find opportunities and occasions for pilgrimage. Constantly, throughout every day, find times of quiet. Be graceful in receiving and grateful for the ministry of oversight. Your relationship with your rector, your fellow priests, your archdeacon and your bishop will be important, not just in terms of line-management, but in terms of spiritual discipline. None of us is a priest alone, we all share in a collegial ministry, and each of us is facilitating the priesthood of the whole royal people of God. Be open to the richness and gifts in other spiritual traditions – within Anglicanism, within Christianity, and sometimes, perhaps, even outside Christianity. Remember in your ministry and mission also that awareness means critical awareness, and be vigilant when it comes to spiritual bullying, elitism, and abuse, including the abuse that expects people to pray in a particular way. Enjoy reading, constantly and daily. Karl Barth says we should get into the pulpit with the Bible in one hand and the newspaper in the other. But also read poetry, fiction and drama, listen to good music, enjoy the arts, be conversationally familiar with soap operas, television drama and what’s happening in sport. Patrick Comerford, ‘Matching prayer life and spirituality with temperament and personality,’ Search: a Church of Ireland journal, 31/1 (2008), pp 37-45. (Revd Canon Professor) Patrick Comerford is Lecturer in Anglicanism, Liturgy and Church History, the Church of Ireland Theological Institute, Dublin. These lecture notes were prepared for an Introductory Weekend with part-time MTh students, Years II to IV, on 19 September 2015. Lichfield Heritage Weekend takes place each year close to Samuel Johnson’s Birthday to celebrate the rich and varied history. Samuel Johnson was born in Lichfield on 18 September 1709, and this year Lichfield Heritage Weekend takes place this weekend, 19-20 September. This year’s theme is ‘Making History,’ with activities celebrating Lichfield’s creative past and present. There are opportunities to discover more with tours, activities and exhibitions taking place throughout Lichfield over the weekend. My photograph of Stowe Pool and boathouse is part of a collection of photographs and posters in a one-day exhibition organised by Lichfield Waterworks Trust and Lichfield Discovered in Saint Mary’s in the Market Square, Lichfield, today [Saturday, 19 September 2015]. Admission is free and the exhibition is open from 10 am to 3.30 pm. The exhibition is designed to complement the Waterworks walks with volunteers from Lichfield Waterworks Trust in attendance. 2, A walk from Saint Mary’s to Sandfields, looking at the history of the pumping station and the surrounding area (meet inside Saint Mary’s at 12.30 p.m.). 3, A surface walk along a stretch of the Hanch Tunnel (meet at the junction of Anson Avenue and Beacon Street at 2.30 p.m.). All these walks are free, and you do not have to book.